Performances Saturday night, June 27, at the Moore Theatre will complete this year’s newly expanded Seattle International Dance Festival. Here’s a preview of the finale, plus highlights from earlier performances. The weekslong Seattle International Dance Festival closes on a big note at the Moore Theatre on Saturday night, with performances by Seattle’s Spectrum Dance Theater and Mexico’s Ciudad Interior Contemporary Dance Company. Ciudad Interior strikes a fine balance between dance prowess and technical wizardry in “Kinetica,” as a video feed translates the dancers’ images and movements into vast psychedelic echoes of themselves. The visual richness is disorienting enough to make their actions look gravity-free at times. Spectrum’s Donald Byrd is also in top form with “Piston,” a new piece set to Walter Piston’s Duo for Viola and Cello. Tapping deep into the music, Byrd interlaces tender touch with stern geometry, all brilliantly executed by Spectrum’s dancers. A revival of Cyrus Khambatta’s “Truth and Betrayal” rounds out Spectrum’s portion of the program. 8 p.m. Saturday, June 27, Moore Theatre, 1932 Second Ave., Seattle; $17-$25 for performance, $42.50 for closing-night party (877-784-4849 or www.stgpresents.org). Venezuela’s Pisorojo Dance Company was represented by only one of its dancers, due to visa difficulties. But what a dancer she is. Yelinka Granado, in “Una gaviota herida a las Orillas del Mar Caribe” (“A Wounded Seagull on the Shores of the Caribbean Sea”), brought a butoh intensity to this solo piece. Swathed in an elaborate costume suggesting tattered plumage, she slowly emerged to forge a visceral connection with her audience through a varied array of tics, shivers and agonized entreaties before withdrawing back into her own feathery heap of fabric. Rob Kitsos, from Canada, created a similar intensity by different means in “Sick Fish,” where his hyper-precise interaction with a prerecorded score and video had you hanging on every detail. Kim Lusk’s “Bang Bang” got the first of the Seattle-centric “Spotlight Series” evenings off to an intricately quirky start as Lusk and Erin McCarthy played with each hiccup in Ryan Hume’s electronic score. The result was pure stagger-stepped clockwork fun. 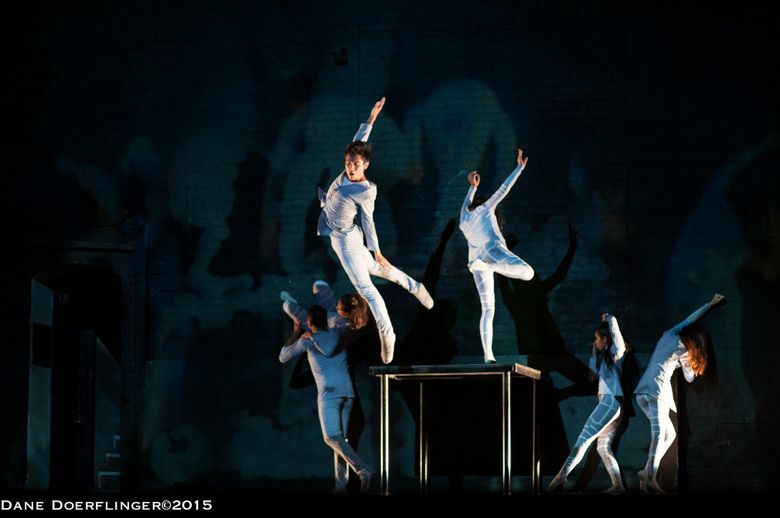 Pacific Northwest Ballet’s Ezra Thomson was behind two festival treats. The first, set to tunes by the band River Giant, was performed by six Spectrum dancers and used the alt-country vibe of the music to launch the performers into a protean swirl of acrobatic partnering and continual reconfiguration. Thomson’s collaboration with Massive Monkees’ Jerome Aparis was another thrill, pitting one dance world against another. Thomson and his partner Sarah Pasch represented Team Ballet, while Timothy Soriano and Thias Lopez played for Team Break Dance. Both teams cheekily imitated the other’s movement. They even shared identical dance phrases, at key points, in their contrasting styles. A genuine out-of-left-field surprise came from Jovon Miller Productions Dance Company. Their “Elemental War” was a creation story that felt a bit hokey at first — until Miller’s remarkable dancers kicked into action. Fusing ballet and break dance into a single startling style, they got a huge reception. Festival director Khambatta’s own troupe, Khambatta Dance Company, premiered new pieces as well, including the ambitious “Fear and Vulnerability,” which offered plenty of striking passagework, particularly between Ethan Rome and Kyle Williams, though it needed some editing. Khambatta deserves huge credit for putting this crazy-rich festival together. It’s become a fixture of the Seattle dance season — always unpredictable as it throws a spotlight on both renowned and unfamiliar talents.